This Divine Liturgy celebrated on the Feast of Saint Andrew the Apostle, Patron Saint of the Church of Constantinople, brings us back to the early Church, to the age of the Apostles. The Gospels of Mark and Matthew relate how Jesus called the two brothers, Simon, whom Jesus calls Cephas or Peter, and Andrew: “Follow me, and I will make you fishers of men” (Mt 4:19, Mk 1:17). The Fourth Gospel also presents Andrew as the first to be called, “ho protoklitos”, as he is known in the Byzantine tradition. It is Andrew who then brings his brother Simon to Jesus (cf. Jn 1:40f.). Today, in this Patriarchal Church of Saint George, we are able to experience once again the communion and call of the two brothers, Simon Peter and Andrew, in the meeting of the Successor of Peter and his Brother in the episcopal ministry, the head of this Church traditionally founded by the Apostle Andrew. Our fraternal encounter highlights the special relationship uniting the Churches of Rome and Constantinople as Sister Churches. With heartfelt joy we thank God for granting new vitality to the relationship that has developed since the memorable meeting in Jerusalem in December 1964 between our predecessors, Pope Paul VI and Patriarch Athenagoras. Their exchange of letters, published in the volume entitled Tomos Agapis, testifies to the depth of the bonds that grew between them, bonds mirrored in the relationship between the Sister Churches of Rome and Constantinople. On 7 December 1965, the eve of the final session of the Second Vatican Council, our venerable predecessors took a unique and unforgettable step in the Patriarchal Church of Saint George and the Basilica of Saint Peter in the Vatican respectively: they removed from the memory of the Church the tragic excommunications of 1054. In this way they confirmed a decisive shift in our relationship. Since then, many other important steps have been taken along the path of mutual rapprochement. I recall in particular the visit of my predecessor, Pope John Paul II, to Constantinople in 1979, and the visits to Rome of the Ecumenical Patriarch Bartholomew I. In that same spirit, my presence here today is meant to renew our commitment to advancing along the road towards the re-establishment – by God’s grace – of full communion between the Church of Rome and the Church of Constantinople. I can assure you that the Catholic Church is willing to do everything possible to overcome obstacles and to seek, together with our Orthodox brothers and sisters, ever more effective means of pastoral cooperation to this end. The two brothers, Simon, called Peter, and Andrew, were fishermen whom Jesus called to become fishers of men. The Risen Lord, before his Ascension, sent them out together with the other Apostles with the mission of making all nations his disciples, baptizing them and proclaiming his teachings (cf. Mt 28:19ff. ; Lk 24:47; Acts 1:8). This charge left us by the holy brothers Peter and Andrew is far from finished. On the contrary, today it is even more urgent and necessary. For it looks not only to those cultures which have been touched only marginally by the Gospel message, but also to long-established European cultures deeply grounded in the Christian tradition. The process of secularization has weakened the hold of that tradition; indeed, it is being called into question, and even rejected. In the face of this reality, we are called, together with all other Christian communities, to renew Europe’s awareness of its Christian roots, traditions and values, giving them new vitality. Our efforts to build closer ties between the Catholic Church and the Orthodox Churches are a part of this missionary task. The divisions which exist among Christians are a scandal to the world and an obstacle to the proclamation of the Gospel. On the eve of his passion and death, the Lord, surrounded by his disciples, prayed fervently that all may be one, so that the world may believe (cf. Jn 17:21). It is only through brotherly communion between Christians and through their mutual love that the message of God’s love for each and every man and woman will become credible. Anyone who casts a realistic glance on the Christian world today will see the urgency of this witness. Simon Peter and Andrew were called together to become fishers of men. This same task, however, took on a different form for each of the brothers. Simon, notwithstanding his human weakness, was called “Peter”, the “rock” on which the Church was to be built; to him in a particular way were entrusted the keys of the Kingdom of Heaven (cf. Mt 16:18). His journey would take him from Jerusalem to Antioch, and from Antioch to Rome, so that in that City he might exercise a universal responsibility. The issue of the universal service of Peter and his Successors has unfortunately given rise to our differences of opinion, which we hope to overcome, thanks also to the theological dialogue which has been recently resumed. 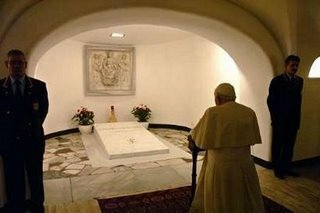 My venerable predecessor, the Servant of God Pope John Paul II, spoke of the mercy that characterizes Peter’s service of unity, a mercy which Peter himself was the first to experience (Encyclical Ut Unum Sint, 91). It is on this basis that Pope John Paul extended an invitation to enter into a fraternal dialogue aimed at identifying ways in which the Petrine ministry might be exercised today, while respecting its nature and essence, so as to “accomplish a service of love recognized by all concerned” (ibid., 95). It is my desire today to recall and renew this invitation. The pontiff conducted the open-air mass next to the ruins of a house where the Virgin Mary is thought to have spent her last years. Security forces had sealed off the area and only 250 invited guests attended, making it one of the smallest crowds to attend a papal mass. The Vatican said the site could accommodate up to 2,000 people. Many of those attending held small Turkish and Vatican flags. 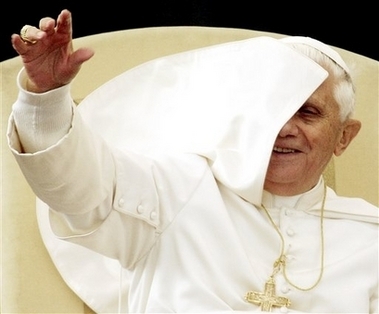 In bright sunshine, the Pope stood on a dais under a white, flower-covered canopy. In this Eucharistic celebration we praise the Lord for Mary’s divine motherhood, a mystery solemnly confessed and proclaimed in Ephesus at the Ecumenical Council of 431. To this place, so dear to the Christian community, my venerable predecessors the Servants of God Paul VI and John Paul II came as pilgrims; the latter visited this Shrine on 30 November 1979, just over a year after the beginning of his Pontificate. Another of my Predecessors was in this country not as Pope, but as the Papal Representative, from January 1935 to December 1944, Blessed John XXIII, Angelo Roncalli, whose memory still enkindles great devotion and affection. He very much esteemed and admired the Turkish people. Here I would like to quote an entry in his Journal of a Soul: “I love the Turks; I appreciate the natural qualities of these people who have their own place reserved in the march of civilization” (pp. 233-4). He also left to the Church and the world the legacy of his Christian optimism, rooted in deep faith and constant union with God. In that same spirit, I turn to this nation and, in a special way, to the “little flock” of Christ living in its midst, in order to offer a word of encouragement and to manifest the affection of the whole Church. With great love I greet all of you here present, the faithful of Izmir, Mersin, Iskenderun and Antakia, and others from different parts of the world, as well as those who could not take part in this celebration but are spiritually united with us. I greet in particular Archbishop Ruggero Franceschini of Izmir, Archbishop Giuseppe Bernardini, Archbishop emeritus of Izmir, Bishop Luigi Padovese, the priests and the religious. Thank you for your presence, your witness and your service to the Church in this blessed land where, at its very beginnings, the Christian community experienced great growth, a fact reflected in the numerous pilgrimages made to Turkey to this day. We have listened to a passage from Saint John’s Gospel which invites us to contemplate the moment of the Redemption when Mary, united to her Son in the offering of his sacrifice, extended her motherhood to all men and women, and in particular to the disciples of Jesus. A privileged witness to that event was the author of the Fourth Gospel, John, the only one of the Apostles to remain at Golgotha with the Mother of Jesus and the other women. Mary’s motherhood, which began with her fiat in Nazareth, is fulfilled at the foot of the Cross. Although it is true – as Saint Anselm says – that “from the moment of her fiat Mary began to carry all of us in her womb”, the maternal vocation and mission of the Virgin towards those who believe in Christ actually began when Jesus said to her: “Woman, behold your son!” (Jn 19:26). Looking down from the Cross at his Mother and the beloved disciple by her side, the dying Christ recognized the firstfruits of the family which he had come to form in the world, the beginning of the Church and the new humanity. For this reason, he addressed Mary as “Woman”, not as “Mother”, the term which he was to use in entrusting her to his disciple: “Behold your Mother!” (Jn 19:27). The Son of God thus fulfilled his mission: born of the Virgin in order to share our human condition in everything but sin, at his return to the Father he left behind in the world the sacrament of the unity of the human race (cf. Lumen Gentium, 1): the family “brought into unity from the unity of the Father and the Son and the Holy Spirit” (Saint Cyprian, De Orat. Dom., 23: PL 4, 536), at whose heart is this new bond between the Mother and the disciple. Mary’s divine motherhood and her ecclesial motherhood are thus inseparably united. The first reading presented what could be called the “Gospel” of the Apostle of the Gentiles: all men and women, including the pagans, are called in Christ to share fully in the mystery of salvation. The text also contains the expression that I have chosen as the motto for my Apostolic Journey: “He, Christ, is our peace” (Eph 2:14). Inspired by the Holy Spirit, Paul tells us that Jesus Christ has not only brought us peace, but that he is our peace. And he justifies this statement by referring to the mystery of the Cross: by shedding “his blood”, by offering in sacrifice “his flesh”, Jesus destroyed hostility “in himself” and created “in himself one new man in place of the two” (Eph 2:14-16). The Apostle explains how, in a truly unforeseen way, messianic peace has now come about in Christ’s own person and his saving mystery. He explains it by writing, during his imprisonment, to the Christian community which lived here, in Ephesus: “to the saints who are in Ephesus and are faithful in Christ Jesus” (Eph 1:1), as he says in the salutation of the Letter. The Apostle wishes them “grace and peace from God our Father and the Lord Jesus Christ” (Eph 1:2). Grace is the power that transforms man and the world; peace is the mature fruit of this transformation. Christ is grace; Christ is peace. Paul knows that he has been sent to proclaim a “mystery”, a divine plan that only in the fullness of time has been carried out and revealed in Christ: namely, that “the Gentiles have become fellow heirs, members of the same body, and sharers in the promise in Christ Jesus through the Gospel” (Eph 3:6). This mystery is accomplished, in salvation history, in the Church, the new People in which, now that the old dividing wall has been broken down, Jews and pagans find themselves united. Like Christ himself, the Church is not only the instrument of unity, but also its efficacious sign. And the Virgin Mary, the Mother of Christ and of the Church, is the Mother of that mystery of unity which Christ and the Church inseparably signify and build up, in the world and throughout history. The Apostle of the Gentiles says that Christ “has made us both one” (Eph 2:14): these words properly refer to the relationship between Jews and Gentiles in the mystery of eternal salvation, yet they can also extend, by analogy, to the relationship between the peoples and civilizations present in the world. Christ “came to proclaim peace” (Eph 2:17), not only between Jews and non-Jews, but between all nations, since all have their origin in the same God, the one Creator and Lord of the universe. Strengthened by God’s word, from here in Ephesus, a city blessed by the presence of Mary Most Holy – who we know is loved and venerated also by Muslims – let us lift up to the Lord a special prayer for peace between peoples. From this edge of the Anatolian peninsula, a natural bridge between continents, let us implore peace and reconciliation, above all for those dwelling in the Land called “Holy” and considered as such by Christians, Jews and Muslims alike: it is the land of Abraham, Isaac and Jacob, destined to be the home of a people that would become a blessing for all the nations (cf. Gen 12:1-3). Peace for all of humanity! May Isaiah’s prophecy soon be fulfilled: “They shall beat their swords into ploughshares, and their spears into pruning hooks; nation shall not lift up sword against nation, neither shall they learn war any more” (Is 2:4). We all need this universal peace; and the Church is called to be not only the prophetic herald, but even more, the “sign and instrument” of this peace. Against the backdrop of universal peace, the yearning for full communion and concord between all Christians becomes even more profound and intense. Present at today’s celebration are Catholic faithful of various rites, and this is a reason for joyful praise of God. These rites, when they converge in unity and common witness, are an expression of that marvellous variety which adorns the Bride of Christ. In this regard, the unity of the Ordinaries of the Episcopal Conference in fellowship and the sharing of pastoral efforts must set an example. In today’s liturgy we have repeated, as the refrain of the Responsorial Psalm, the song of praise proclaimed by the Virgin of Nazareth on meeting her elderly kinswoman Elizabeth (cf. Lk 1:39). Our hearts too were consoled by the words of the Psalmist: “steadfast love and faithfulness will meet, righteousness and peace will kiss” (Ps 85:10). Dear brothers and sisters, in this visit I have wanted to convey my personal love and spiritual closeness, together with that of the universal Church, to the Christian community here in Turkey, a small minority which faces many challenges and difficulties daily. With firm trust let us sing, together with Mary, a magnificat of praise and thanksgiving to God who has looked with favour upon the lowliness of his servant (cf. Lk 1:48). Let us sing joyfully, even when we are tested by difficulties and dangers, as we have learned from the fine witness given by the Roman priest Don Andrea Santoro, whom I am pleased to recall in this celebration. Mary teaches us that the source of our joy and our one sure support is Christ, and she repeats his words: “Do not be afraid” (Mk 6:50), “I am with you” (Mt 28:20). Mary, Mother of the Church, accompany us always on our way! Holy Mary, Mother of God, pray for us! Aziz Meryem Mesih’in Annesi bizim için Dua et. Amen. This journey starting today promises to be one of the most sensitive in the history of modern papal trips due to tensions that have amassed around its ecumenical focus. With what kind of spirit are you facing it? 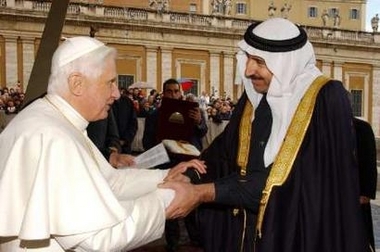 The enormous importance enjoyed by the question of ties between the West and the Muslim world has ensured that this matter – in reality not the main reason for the trip – will dominate, especially after the “lectio magistralis” of Regensburg and Muslim reactions to the same. Government leaders in Turkey joined the fray to criticize the pope’s words in that lecture, which is peculiar in a country that makes a constitutional principle out of its secularism. Moreover, such a reaction confirms the substantial attention Turkey is paying to its religious identity at the moment. Further confirmation is provided by the presence of a Muslim party leader, even if “moderate”, at government meetings, and the increased number of women who wear a headscarf to go out. The focus of attention on anti-papal rallies is a lingering problem despite the numbers that protesters have managed to draw to the streets: perhaps 30,000 in Istanbul yesterday, in response to an appeal by the Muslim party Saadet, which was hoping to get one million people. Then there were 100 at the symbolic occupation of Santa Sofia and one man who fired into the air outside the Italian Consulate. However, the fact remains that according to latest polls, only 10% of Turks approve of the pope’s visit, while 38% are decidedly against, another 38% are indifferent and 14% preferred not to express their views. The fact is that the “offence to Islam” felt because of the – barely read – lecture in Regensburg has become intertwined with the “Europe question”, that is, with demands put forward by the European Union for Turkey’s entry. Thus, European demands like respect for religious freedom, the elimination or radical change of Article 301 of the Criminal Code (held to be contrary to freedom of expression), limiting army interference in public life and, especially, the request to open ports and airports to the hated Republic of Cyprus (an EU member), have been viewed as a “western” – hence sort of “Christian” – imposition. So a nationalist reaction was born in defence of Turkish identity, of which Islam is felt to be a part, contrary to Christianity. All this may even have pleased the current government were Erdogan not objectively deeply committed to taking Turkey into Europe. The government attitude has thus taken on contradicting tones and behaviours as it seeks to follow the wave of reactions and press ahead with its programme. On the one hand, in the aftermath of Regensburg, the head of religious affairs, Ali Bardakoglu, came out against the pope, and Tayyp Erdogan himself criticised his words. The premier, foreign affairs minister and Parliament speaker all made it clear – a while ago – that they would not meet Benedict XVI because of prior engagements abroad, so much so that the Aksam daily published a front page photo of the pope with the caption “The pope is coming, run!” On the other hand however, on the eve of the pope’s arrival, the premier said there may be adjustments made to his programme to enable him to see the pontiff. The second reason – and in reality this was the main objective – for the visit is ecumenical, that of furthering ties with the Orthodox and especially with the Ecumenical Patriarchate of Constantinople, the “first in honour” of all the patriarchates. The ecumenical journey, especially with Churches of the East, is high on the agenda of this pontificate, according to what Benedict XVI himself has said. The first invitation to the pope to go to Turkey was made by Patriarch Bartholomew I already last year and it is not by chance that Benedict XVI refused suggestions to change the dates of the trip that “must” be around 30 November, the feast of the apostle Andrew, founder of the Church of the East, as Peter is the founder of that of the West. 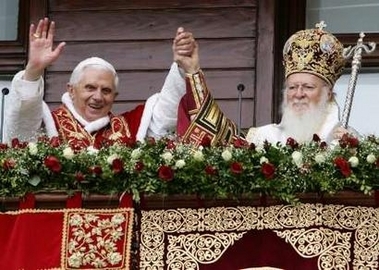 The pope and Bartholomew I will meet three times over two days; each will go to the Church of the other to celebrate a ritual, they will have private talks and will sign a joint declaration together. No historic announcements are expected in this document, nor any leaps in the ecumenical journey, but certainly another step ahead is anticipated, not least in the light of deliberations of the now reactivated mixed commission that is tackling theological matters. A few weeks ago, in Belgrade, it even touched upon the fundamental problem of the Petrine Primacy. The third reason for the visit is to meet the miniscule Catholic community – a few thousand people – wounded by the murder of Don Andrea Santoro on 5 February last. The meetings with the pope, in Ephesus on 29 November and in Istanbul on 1 December, will surely hearten this community. 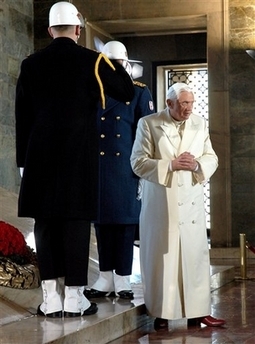 Before, Benedict XVI dwelt upon the meaning of today’s feast: Christ, King of the universe. The pope said: “He did not come to dominate peoples and lands, but to free men from the slavery of sin and to reconcile them with God.” The pontiff turned to the gospel of today’s Mass, which presents the dialogue between Jesus and Pilate, during which the scourged Jesus claims for himself the title of king and witness of truth. “But what is the ‘truth’ that Christ came to testify to in the world?” asked the pope. “His entire existence reveals that God is love: this then is the truth to which He bore full witness with the sacrifice of his very life on Calvary. 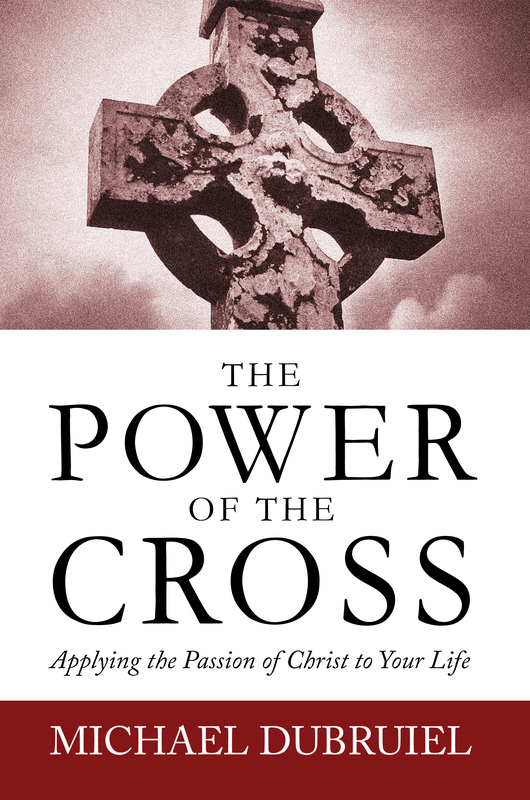 The Cross is the ‘throne’ from which he revealed the sublime royalty of God Love: offering himself in expiation for the sins of the world, He defeated the dominion of ‘the prince of this world’ (Jn 12:31) and he installed the Kingdom of God definitively. A Kingdom that would manifest itself fully at the end of time, after all its enemies, finishing with death, would have been destroyed (cfr 1 Cor 15:25, 26). This Christmas, let's keep the "Mass" in Christmas...and Christ will reign supreme! 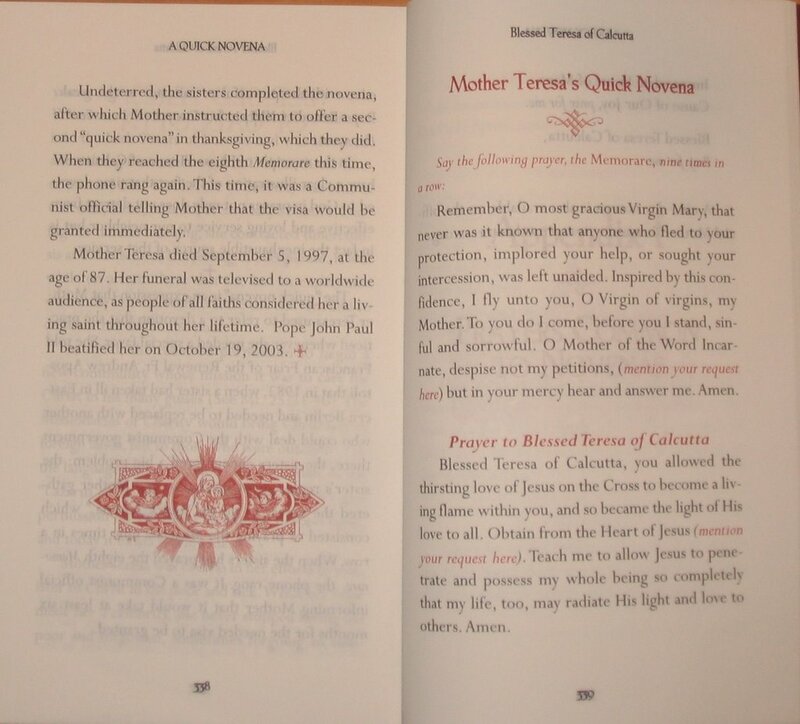 Give a personalized copy of The How-To Book of the Mass or How to Get the Most Out of the Eucharist...for more details go here. The plot of The Nativity Story is familiar enough. But the parallels between the lives of the Virgin Mary and the teenage actress who plays her in the first feature film to be premiered at the Vatican are causing controversy. The Pope, upon whose doorstep the first showing takes place on Sunday, will not be attending. Nor will Keisha Castle-Hughes, the 16-year-old unmarried actress who plays Mary and who is expecting her first child in the spring. Castle-Hughes, who said she was “thrilled” to be pregnant”, said she had made the film “in a state of grace”. Playing Mary, a “sweet, strong and courageous” figure, had been “a source of spiritual richness”. A Vatican spokesman said yesterday that the Pope “never was going to attend. The surprise would have been if he had.” His decision had nothing to do with the film. He is 79 and preparing for a visit to Turkey on Tuesday. The "Blue" Mosque is in the same neigborhood as the Hagia Sophia. I've been there a couple of times--you have to leave your shoes in the courtyard, but someone will probably carry the pope's shoes, don't you think? You also make ablutions at the fountain before entering--similar (but not the same) to Catholics blessing themselves with holy water when entering a church-actually the priest washing his hands may be a more apt metaphor to what one does when entering a Mosque. Pope Benedict, who drew fire from Muslims over his comments on Islam, is likely to make a hastily added stop at Istanbul's Blue Mosque on his trip to Turkey next week, the Vatican said on Saturday. It would be his first visit to a mosque. 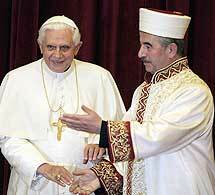 His predecessor, Pope John Paul II, made the first visit by a pontiff to a mosque during a trip to Damascus in 2001. Let all men know your forbearance. The Lord is at hand.Have no anxiety about anything, but in everything by prayer and supplication with thanksgiving let your requests be made known to God. Benedict XVI's journey to Istanbul, formerly Constantinople, is laden with the wounds of history both ancient and painfully contemporary. The Pope's controversial Sept. 12 lecture in Regensburg, Germany, quoted a 14th century exchange between a Byzantine Christian Emperor and a Muslim intellectual in which the Emperor made some distinctly uncomplimentary observations about Islam. The Pope admitted that the Emperor's statement was brusque. But his point in reaching so far back into history was to demonstrate that problems between the Christian West and Islam long precede today's "war on terrorism." When you compile a book of prayers, you hope that they will be prayed--and more importantly that those praying will experience the power of prayer in their lives. That is what makes this blog post so important--it is a witness to the power of prayer. Besides thanking God for my son's health and speedy recovery, I'd like to thank all my family, friends and fellow bloggers who offered up prayers on his behalf. Most especially, I'd like to acknowledge the celestial assistance of two saints: St. Apollonia, the patron of tooth problems who will continue to be petitioned by me for her prayers until Fritz's adult teeth grow in properly, and St. John Newmann to whom our family prayed a novena before Fritz's biopsy when we feared he had cancer. 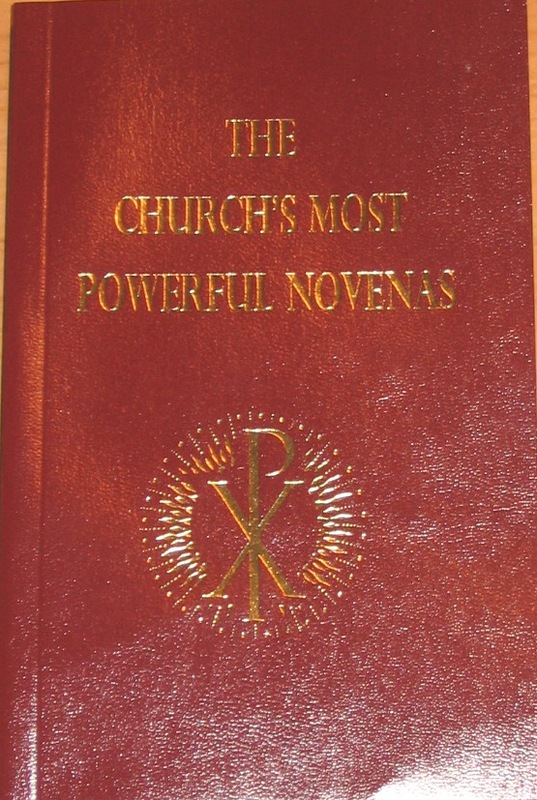 I found the novena in a book I love: (Mention Your Request Here): The Church's Most Powerful Novenas by Michael Dubruiel. This book has been updated and is due for re-release later this month. I highly recommend it. 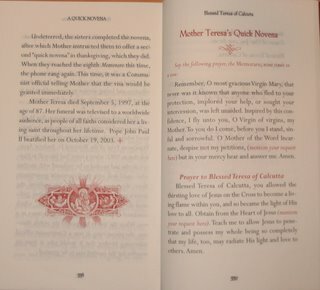 Mother Teresa's express novena, the rosary novena, the novena to the Precious Blood and Padre Pio's Sacred Heart Novena. Father Joseph Classen would understand. While not primarily a hiker or mountain climber, this young priest of the Archdiocese of St. Louis spends a lot of time in the wilderness and appreciates its beauty as the work of the Creator. Here he takes us along on his expeditions in the various hunting and fishing seasons of the year: stalking deer with a bow and arrow, casting his line into trout streams and chasing elusive wild turkey. The trips are leavened with self-effacing humor as he lets us see how God uses nature to check his pride. His spirituality developed when he was a boy spending time in the outdoors and he thought about the priesthood, but later those thoughts faded. Just as many others do, he went through a period of questioning his faith. In college, he returned to the church, he said. Hunting and fishing, he said, is hands-on stewardship and a way of taking an active role in the food chain. People who hunt and fish have a deep respect for food, he added. The editor of the Catholic Anchor, the newspaper of the Archdiocese of Anchorage, is leaving the paper after only two months on the job. Maia Nolan's resignation comes after she was criticized for comments she made on a personal blog about a year-and-a-half ago, regarding the late Pope John Paul II. Nolan says she's leaving the paper to focus on a master's degree in creative writing. “Ultimately, I resigned because I'm a full-time grad student,” Nolan said this week. Forget About Politicians and Lay People, What About Priests? Dissent from church teaching usually comes from the altar...as an old saying has it "every heresy comes from the altar" meaning the clergy. Until there is some real policing of dissenting clerics, clerics who've lost their faith, etc.--I doubt anyone can expect the laity to walk lockstep when their pastors aren't. For every John Kerry there is a Jesuit or Paulist priest advising him that he can do and say what he wants (in good conscience) and remain a Catholic in good standing. Why? Because they (the clerics) do this and aren't removed or even reprimanded. three children, they'd be better informed on what constitutes great parenthood. is a necessary part of parenthood." A clasmate of Cardinal Levada's, btw. Confusion in the Press? Pope to Hold Summit on Married Priests? From the Wall Street Journal's "Sense of Ummah"
"This looks like it could be the year of the Gator," Spurrier said afterward. "Everything's going right for them." Said game-saving UF defensive end Jarvis Moss, the man who blocked the game-winning kick and one other: "We can sense something special is going on. We're going all the way. There's no doubt in my mind we're going to wind up in Arizona [playing in the national-title game]." Spurrier -- a k a Stevie Spoiler -- beat the Gators last year and ruined Florida's chances of winning an SEC title. And Saturday, he came into his old Swamping grounds and nearly cost the Gators a chance at possibly winning a national title. Before the game, Spurrier's wife, Jerri, whom he met at UF and married 40 years ago, sat anxiously in a luxury box with a worried look on her face. Like everybody else in the stadium, she probably felt confused and conflicted. Here was Steve Spurrier, who named The Swamp, trying to drain The Swamp. Here was Steve Spurrier, the father of Florida football, trying to burn down the family home. "This isn't fun," Jerri said with a pained expression. Actually, it was a blast -- one of the most uptight, unnerving, emotionally charged games I've ever witnessed. A game of mixed emotions and split allegiances, a game of duality and dichotomy. Afterward, Spurrier, the old boy from Florida, waved at a section of cheering Florida fans. And then Spurrier, the new head Gamecock, gave the thumbs-up sign to a section of disappointed South Carolina fans. Perhaps Spurrier's son-in-law, Jay Moody, a UF grad, put it best when he said afterward, "I don't know if I'm supposed to be happy or sad." There was no question how Meyer felt afterward -- delighted, excited, fired up, jacked up and, mostly, relieved. He knew he had to win this game, not just to help keep Florida's national championship hopes alive, but to help kill UF's massive man-crush on Spurrier. No doubt about it, the Urban Legend needed badly to beat the real legend. Even though Meyer said in the days leading up to the game that this was "about beating South Carolina," nobody believed him. And afterward, he admitted beating Spur-Dog was bigger than he let on. "It means a lot -- more than I'll ever admit to, more than anybody will ever know," Meyer said. Yes, there always will be a Spurrier shadow hanging over whoever is UF's coach, but the victory Saturday let a stream of light pierce through and shine onto Meyer and the program he has turned into a national-title contender in just two years. It was Meyer's offense that drove down the field when it had to Saturday. It was Spurrier's offense that mismanaged the clock at the end, wasted time and didn't even use all of its timeouts. He might have left UF five years ago, but the Spurrier coaching era didn't really and truly end until Saturday. King Steve has been conquered. God once again is grinning on the Gators. In his address on Saturday, titled, "Language in the Latin Rite Liturgy: Latin and Vernacular," Arinze said the Roman church used Greek in its early years, but was "Latinized" in the fourth century. "The Roman rite has Latin as its official language," he said. The great religions of the world all "hold on" to their founding languages — Judaism to Hebrew and Aramaic, Islam to Arabic, Hindu to Sanskrit and Buddhism to Pali. "Is it a small matter," he asked, for priests or bishops from around the world to be able to speak to each other in universal language of the church? Or for "a million students" who gather for World Youth Day every few years "to be able to say parts of the Mass in Latin?" In an hourlong, often humorous, address that received several standing ovations, Arinze suggested that, in order to give Catholics options, large parishes offer the Mass in Latin at least once a week, and in smaller, rural parishes, at least once a month. (Homilies, he said, should always be in the faithful's native language.) Latin "suits a church that is universal. It has a stability modern languages don't have," he said. Last month Vatican officials said Pope Benedict XVI would soon loosen restrictions on the Latin, or Tridentine, Mass. In the 1960s the Second Vatican Council approved the use of vernacular translations of the Tridentine Mass, and today most Catholics are familiar with the celebration of Mass in their own languages. their annual conference in Baltimore next week. Go to the story for all the details. did not receive any permission from Roman Authorities regarding the plans of Fr. Among the various religious groups, 76 percent of Protestants, 64 percent of Catholics and 30 percent of Jews said they are "absolutely certain" there is a God while 93 percent of Christians who describe themselves as "Born Again" feel certain God exists. When questioned on whether God is male or female, 36 percent of respondents said they think God is male, 37 percent said neither male nor female and 10 percent said "both male and female." Only one percent think of God as a female, according to the poll. Asked whether God has a human form, 41 percent said they think of God as "a spirit or power than can take on human form but is not inherently human." As to whether God controls events on Earth, 29 percent believe that to be the case while 44 percent said God "observes but does not control what happens on Earth".